"In the warm, horsey gloom of the stable, Death's pale horse looked up from its oats and gave a little whinny of greeting. The horse's name was Binky. He was a real horse. Death had tried fiery steeds and skeletal horses in the past, and found them impractical, especially the fiery ones, which tended to set light to their own bedding and stand in the middle of it looking embarrassed." The Reaper Man is the 11th novel in the Discworld series -a humorous fantasy series- by Terry Pratchett; but Discworld really isn't the kind of series you have to read in a particular order! And I've heard The Reaper Man is a great way to begin reading the series!! 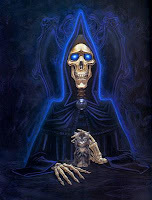 Death is one of my, if not my most, favourite Discworld characters! He is a seven foot tall skeleton in a black robe and carries a very sharp scythe. He likes cats and he only talks in booming CAPITAL LETTERS (he technically has no voice, so what he says directly enters people's minds, without ever being spoken!) Death is never portrayed as cruel or ruthless, just very efficient. Interesting teaser! Here is my teaser for this week. Great teaser! My boyfriend is reading the discworld books and he wants me to read them too. I love Terry Pratchett's Discworld... Death is one of my fav characters. This is hilarious! I've heard of the Discworld series but never delved into it. LOL I thought that was a pretty funny teaser :) I have to check out the Discworld series, I've heard nothing but good about it. Fascinating teaser...love the book cover! these books sound really cool ive never heard of them before. i'm gonna have to check them out. great teaser! Great teaser! After Rincewind, Death has got to be my second favourite character (with Corporal Nobby coming in third). @Iwriteinbooks - I'd say, it's more funny!! @Sally Sapphire - Rincewind is pretty awesome too, yes!! That is hilarious! I still haven't read Terry Pratchett. Gotta get around to that someday! I love the simple layout of your blog. Here's my teaser. Happy reading! I really HAVE to get these books! This teaser is great! And it's Terry Pratchett, which makes it a no-brainer to place on the to-buy list! Ah, you have some scary creepy ones on your list! And a bunch of them I don't know, but want to read about! Sounds funny! Great teaser. If you get a chance, mine is here. What a teaser!! Another novel to check out?!. I really like teaser tuesdays! Here is my Teaser Tuesday: Before I Go To Sleep by S J Watson post! @Suey - I think you commented on the wrong post ;) But thanks, anyway, for stopping by!! Im so glad you visited my teaser - that quote perked my day up. Thank you for visiting my teaser (at bokunosekai.wordpress),I am now using my pet's blog because your form has no option for name and url. @Deepali - I love Discworld :D Susan's awesome too, but Death is like my all-time favourite!